In the early 1970s Ducati abandoned GP Motorcycle racing and for many years the 500cc class was dominated by two-stroke engines, a technology far removed from the 4stroke road-going Ducatis. 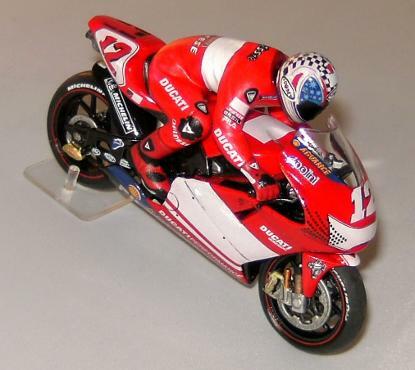 In 2002 the introduction of the new MotoGP Championship brought new technical rules encouraging Ducati back into the world of Motorcycle racing. Ducati historically based their designs on L-twin engines with desmodromic valve technology and initially thought about using a super-twin design. This would give a considerable weight reduction over 4, 5 or 6 cylinder bikes, but was found to be unable to produce a competitive power output. 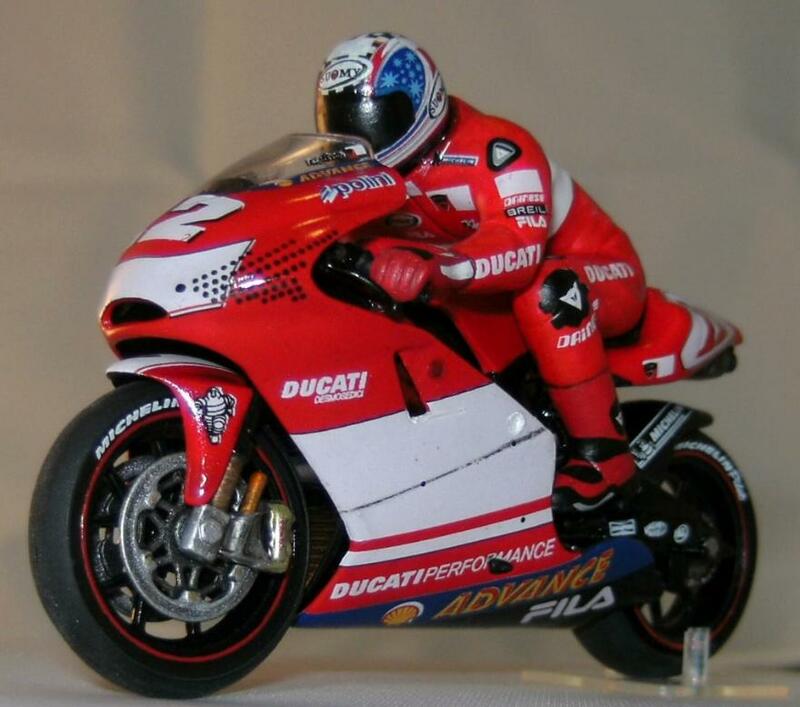 Ducati then tried out the idea of double 2 stroke L-Twin engine; a Twin Pulse engine. They used four valves per cylinder to improve engine breathing and made the action of the valves a totally mechanical system. Desmodromics added to 16 valves was be shortened in Italian to be Desmosedici. 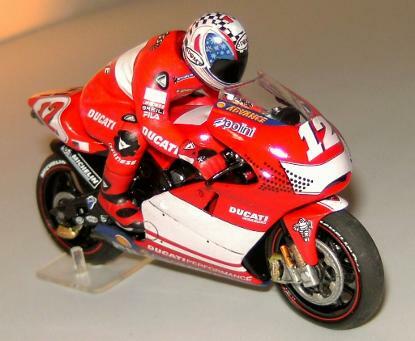 Design work started in 2001 with Ducati Corse test-rider, Vittoriano Guareschi, then putting in the practical track work to make the bike ready for its unveiling at the Italian GP, at Mugello, in 2002. 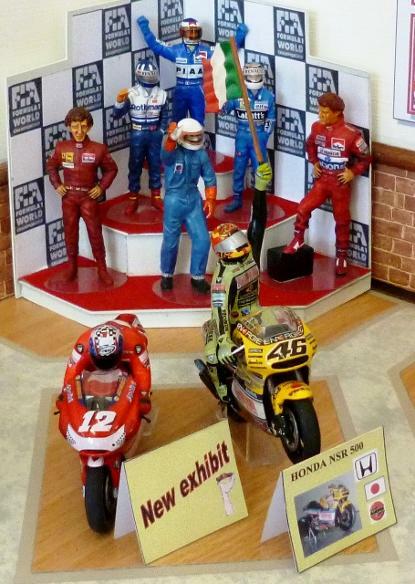 His work continued right through to the 2003 MotoGP World Championship season. 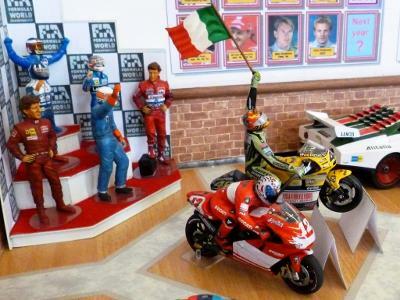 When round 9 of the 16 FIM World championship series the race got underway Max Biaggi made a terrible getaway and slipped from pole to 10th place by the end of lap 1. Valentino Rossi shot through from 12th on the grid to be 5th into turn 1. He then pulled off an audacious double pass on the Loris Capirossi and Sete Gibernau at the entry to the penultimate turn. Rossi quickly built a 3 sec s advantage over Gibernau as the pair pulled away from the field headed by Marco Melandri on a Yamaha YZR-M1. To the delight of the German crowd Gibernau caught and passed Rossi then rode a defensive race keeping Rossi behind him. Melandri s brilliant performance was cut short by a gear problem entering the tight turn 12, with just 7 laps remaining. Biaggi made a great comeback to run as high as third battling with Ducati s Troy Bayliss who was on his debut at the Sachsenring. But after passing Bayliss and pushing hard to catch the leading pair Biaggi lost the front end at turn 10 and slid out into a gravel trap. On the Last lap Rossi pushed back in front of Gibernau but on the last corner made and uncharacteristic mistake and ran wide allowing Gibernau a better run off the corner and a 0.06-second advantage at the finish line. 13 secs later Troy Bayliss crossed the line for 3rd with his Ducatti team mate Capirossi 4th. 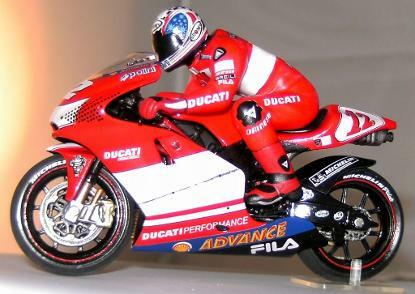 The pinnacle of the design was reached in 2007 when Ducati rider Casey Stoner used a Desmosedici to win Ducati's first MotoGP World Championship Title. Built during the winter of 2012/13 this model was finished with Halfords car spraypaints and citadel acrylic paints and ink washes. Unlike the Honda this model has no additional details but doesn't look any the worse for that, proving the kits have a more than acceptable level of detail for their simple construction. If there is a problem with these kits it is the rider decals. they seldom locate properly and need careful application of decal softeners like Microsol or Daco to get them to settle nicely around all the compound curves. Speaking of decals, they have all been covered with Klear to protect them from drying out and cracking.